KGF Chapter 1, starring Rocking Star of Kannada, Yash, and debutant Srinidhi Shetty, has been one of the most hyped and much-anticipated projects of south India, and the movie has been planned as a simultaneous release in Tamil, Telugu, Malayalam, Kannada, and Hindi. Here's team AP Herald's exclusive first on net KGF Chapter 1 review. Young Rocky is on a mission. He has a dream to become rich and powerful, and die rich and hence sets out on a journey from the streets of Mumbai to Kolar gold fields, and his life turns upside down when he's elevated from the level of a slave in service to a Deadly goon and a don who's influential. The movie is presented as narrated by a journalist who records his life. Kgf (2018) KGF Chapter 1, starring Rocking Star of Kannada, Yash, and debutant Srinidhi Shetty, has been one of the most hyped and much-anticipated projects of south India, and the movie has been planned as a simultaneous release in Tamil, Telugu, Malayalam, Kannada, and Hindi. Here's team AP Herald's exclusive first on net KGF Chapter 1 review. Young Rocky is on a mission. He has a dream to become rich and powerful, and die rich and hence sets out on a journey from the streets of Mumbai to Kolar gold fields, and his life turns upside down when he's elevated from the level of a slave in service to a Deadly goon and a don who's influential. The movie is presented as narrated by a journalist who records his life..
kgf ,yash dubbed in telugu now , he was super star kannada movies ,now he was enter to this telugu ,so here movie was action entertainer ,yash and other actors also done good ,so here music and all action trailers are good to watch on social media so hope movie will be block buster . 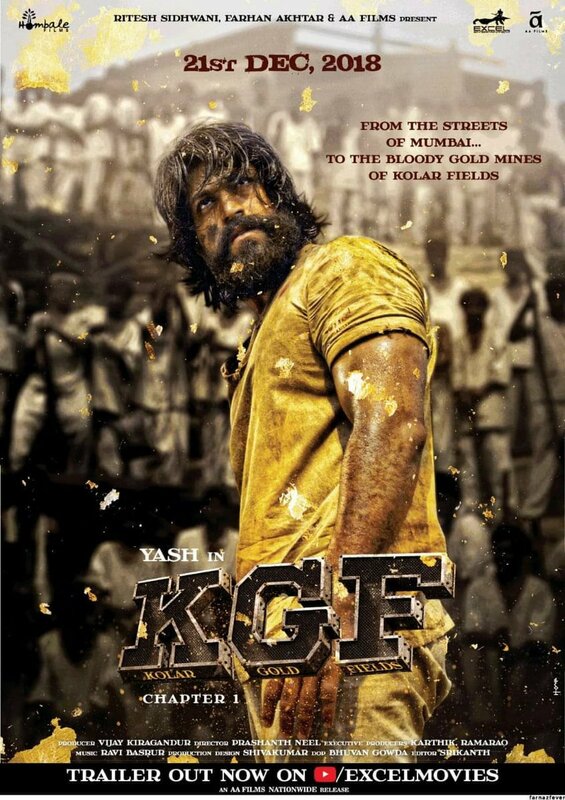 'KGF' Is Over The Top, It Is Overstretched Exercise In Hero Worship. Has Excessive Violence And In-your-face..
All In All, KGF Is A Full Meal For Masses. Yash Will Surely Leave A Mark With His Solid Screen Presence, So..
KGF Chapter 1' Is A Gangster Movie Which Offers A Unique Experience. Gold Mines Backdrop Mayn't Have Been..
On The Whole, KGF Does Not Live Up To The Colossal Expectations Laid Upon It. The Film Is A Regular Crime..
KGF Chapter 1 Is Stylish And Filled With Terrific Visuals, Top-notch Action And Some Goosebumps Moments, That.. The Narrative In The First Part Builds The Character Of Rocky As The Maverick Mastermind Who Will Not Stop..
KGF Movie Team Interview Latest..
KGF Telugu Pre Release Full Event..